I`m the woman for the numbers. Since 1994 I am active as financial accountant in the costing department of the recorder centre Bremen. Working in the Löbner-team brings me a great deal of joy. Through my work I got interested in the recorder and was inspired to learn the instrument in the age of 36 years. Motivated by playing together in different Playing circles I started also learnign the bass recorder and the c-recorders over the years. Playing the recorder gives me the neccessary relaxation and also promotes at the same time the skills of my fingers and my brain. Born and raised close to Stuttgard in Württemberg. 1980 I left school and was bale to do a half year internship with Hans-Peter Springer , who was specialized on servicing and repairing the concert-oboe. Afterwards I started my education as a woodwind-instrument maker in 1981 with the company Roessler in Schleswig-Holstein and finished it 1985 with a apprenticeship diploma. My way led me to Montreal/Canada was able to work for the recorder manufacturer Jean-Luc Boudreau for half a year. Back in Germany I established my own specilized store for recorders only in fall 1986, comprising the repairing-, servicing-, advising-, sale and manufacturing of recorders. The recognition of the name of my store soon reached bigger circles, so that we- my colleagues and me- were able to have customers of all over Europe on the phone and welcome them in our store. To me it is a great pleasure to see the enthusiasm and joy of our customers, when they got an instrument or their own recorder functioned properly again after succesful repairing. We- my enthusiastic colleagues and me- can always give many recorder players tips for sheet music- on the composition or instrumentation- with fingerings- or questions of articulation and help with questions to hoarseness and the right maintenance of their recorder. Even after such a long time in this business to me this is the so called 'salt in a soup' of daily working routine. I am working for the team of the recorder centre since 1999. I was born and raised in Bremen and studied here at the music-college vocals with Elke Holzmann. In the moment I am singing for a very good church choir and also perform solo once in a while. I enjoy attending our customers in store or at the telephone. 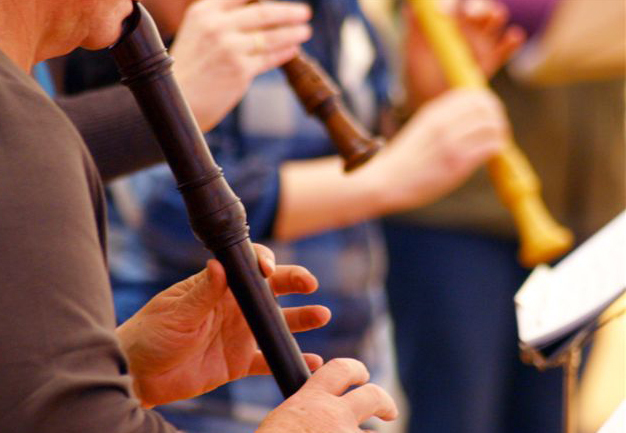 With our great selection it is hard to make a choice and our customers are always happy, when I play the different recorders for them and help them thereby to make their decisions. From time to time I also support our team on exhibitions and this way always have opportunities to experience and meet many recorder players out of Bremen. It brings me great pleasure to bring my musical knowledge and abilities into new context here and to support and help our tea. 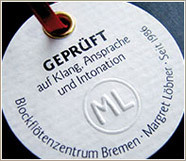 Born and raised in Bremen I studied at the Music-school of applied sciences Lübeck recorder with Annemarie Thiel, with whom I took my exam as diploma-music teacher. Since 1980 I am teaching recorder at the music school Bremen. Next to various concert-activities as recorder player I sing in different choirs and soloistic ensembles music by Lasso to Ligeti. Since 1998 I am working at the recorder centre Bremen. There I am taking care of the customers at the telephone and directly in our shop. 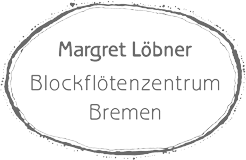 It brings me special joy, to help the customers to find THEIR instrument and choose it and to once in a while accompany Margret Löbner to exhibitions and support her. Furthermore I keep our huge assortment of sheet music up-to date and help to keep the computer amused.